(Nanowerk News) Durable paint, water purification, faster computers, tougher shoe soles, and lighter and cheaper televisions are all possibilities now that a Queensland University of Technology (QUT) scientist has discovered a way to disperse gold nanoparticles evenly through plastic. 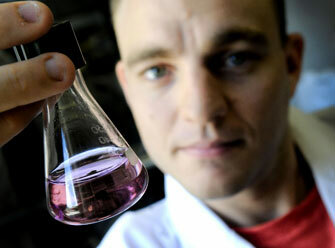 Adrian Fuchs, from QUT's School of Physical and Chemical Sciences, said the technique he had developed was a model for dispersing metals in nanoparticle form throughout polymers or plastic materials. "The properties of metals change when they are in nano form and so combining the unique property of nanoparticles with plastic leads to a whole new range of composite materials that could be used for novel catalysts, drug delivery, and coatings," Dr Fuchs said. "Paint is essentially a plastic so when gold nanoparticles are added it makes colours more intense across the whole visible spectrum. The paint would also be more durable when exposed to a harsh environment." Dr Fuchs said gold had good conductivity and became a useful catalyst when mixed with different metals. "If you put gold nanoparticles with titanium dioxide using a plastic mould, you can make a very efficient catalyst to purify water; the titania absorbs the light and converts it into electricity which is then passed into the conductive gold," he said. Dr Fuchs said his method for dispersing nanoparticles through plastic could also be applied to encapsulating drugs into plastic casings so that they could be ingested and used for cancer detection and destruction.